In a large saucepan or small stockpot over medium heat, warm the oil. Add the onion and garlic and cook, stirring occasionally, until slightly softened. Add the curry powder and cumin and cook, stirring occasionally, until fragrant, about 1 minute. Stir in the sweetpotatoes, broth, tomatoes, lentils, and ginger and bring to a boil on high heat. 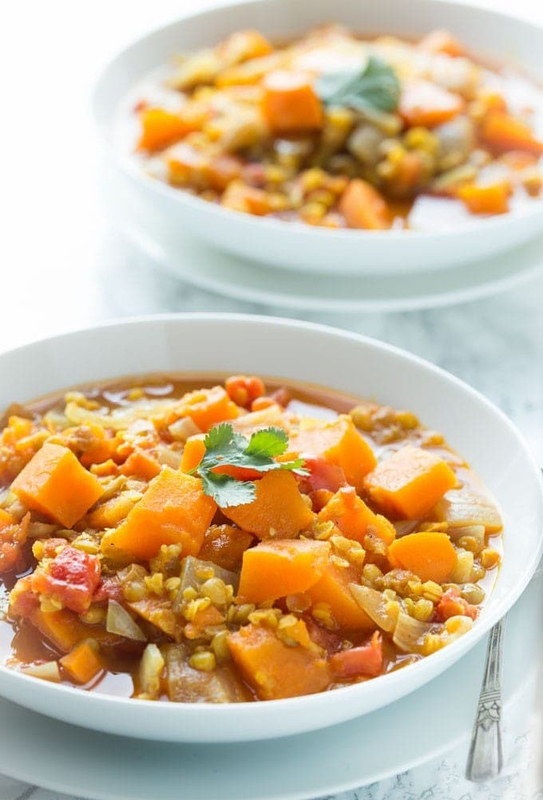 Reduce to a simmer, cover, and cook until the sweetpotatoes and lentil are tender, about 20 minutes. Add salt and pepper taste. Serve garnished with cilantro. If you like, add a dollop of yogurt and serve naan on the side. Note from Sheena at Noshtastic: This is typically a very mild curry, the only chili powder added is what's included in the curry powder mix. That said, curry powders are often labeled mild, medium, and hot so make sure you check the label before you use it! If you want additional heat you can add some chili powder to kick it up a notch.